What’s going on in Ferguson? We have failed as a community to treat each other as kin. This is apparent in the way this incident was handled. If Mike Brown had been Ferguson Police Officer Darren Wilson’s son, he would still be alive. This is not about breaking the law, or being under the suspicion of breaking a law. Every adult, at some point of their lives, likely has broken the law, but it doesn’t have to cost a life. We have a judicial system to assess crime and punishment. The situation in Ferguson, where there is mistrust of that authority, exposes the issues that are deeper and more systemic, like failing educational systems, profiling, and the lack of trust between people that are different from one another. Today Missouri Governor Jay Nixon said there may be “bumps in the road” ahead. No doubt. How we navigate those “bumps” will be key. Some of the media who covered my public remarks in Ferguson identified me as a “mother.” I am a mother; I am also the Director of Racial Justice for the YWCA Metro St. Louis. Racism is a social construct, and its defeat can be as well. I am encouraging everyone to reach for each other with love, as if we are connected and related. If we are going to learn from this incident, grow, and elevate our current disconnection, we are going to have to embrace, support, and handle each other as if we were related. In scholarship, this is called “fictive kinship,” meaning that, although we are not related, we are claiming each other as if we were in the same bloodline. As women, we do this with each other all the time: our best friends are often referred to as our sisters and our children even call them aunt. It happens with men, too. If we are going to get through and beyond this, we are going to need to adopt this belief. It will dramatically change our actions and work toward healing. The world is watching, and it will take all of us to move forward in healing communities. I don’t know Darren Wilson, so I am going to take some license that he is a good person who misjudged his response to the situation. If Mike Brown had been his biological son, he would have handled the situation much differently. Maybe he would have taken him to the police station and booked him, or talked sternly about the positive responsibilities of manhood. If I apply this rule to myself and other mothers, Mike Brown could have been our son; in some ways, fictively he is my son. As a professional and as a mother, I never want to see a young person die from violence. Nor do I want tear gas, police dogs or swat teams used on U.S. citizens who are protesting. The tragic events this week in Ferguson highlight the importance of the YWCA historically and today. We have much work to do in this community and others around the world to prevent these moments. We need the support of our community leaders, major corporations, supporters and families to fulfill the YWCA’s mission of eliminating racism and empowering women. A mother’s movement is a powerful force. This incident has provided an opportunity for the YWCA to make a difference. We can take a stand against violence in any form, support grieving families, assist in peaceful demonstrations, and teach our youth to accomplish change through non-violent means. It has opened the dialogue about the need for more racial justice programming, like our Witnessing Whiteness groups to educate, inform, train and equip our white allies for social justice advocacy. Or our Mosaic Group, for people of color, to understand the impact of racism and to heal and work towards liberation from its harm and hurt. I have seen the good that honest communication in a safe space can accomplish. Together, we can change the world for the better. 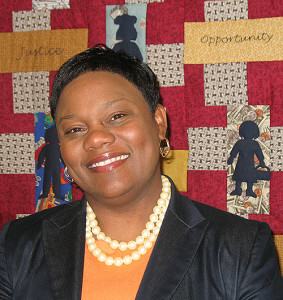 As director of racial justice for YWCA Metro St. Louis, Amy Hunter is responsible for ensuring that eliminating racism, part of the YWCA’s two-prong mission of eliminating racism and empowering women, is incorporated in all of the organization’s internal and external programming. She serves as a representative of the YWCA in matters that address institutionalized and systemic oppression. She joined the YWCA in 2008; she has more than 15 years of experience in the corporate sector. She previously worked at Edward Jones in the area of diversity and served on the faculty for the Dismantling Racism Institute, a program of The National Conference for Community and Justice. Hunter has provided strategic direction for organizational development for universities, school districts and the corporate community. She has published works and is a presenter on issues of race and social justice throughout the United States and Canada. Hunter is a native St. Louisian and is currently pursuing her PhD in Social Justice from the University of Missouri St. Louis. She has served on several boards and committees in St. Louis. Hunter’s zeal and passion for creating an equitable society is unmatched. She is extremely busy being engrossed in her quest for equality while loving and being loved by her family.